What The Hell Is Herm Edwards Talking About? Two positives, before we get to the weirdness: For one, these answers sound a bit like a guy trying to sound tough without really knowing where his sentences are going, as seen most clearly when a reporter asks what exactly the roster status of these cut guys would be. 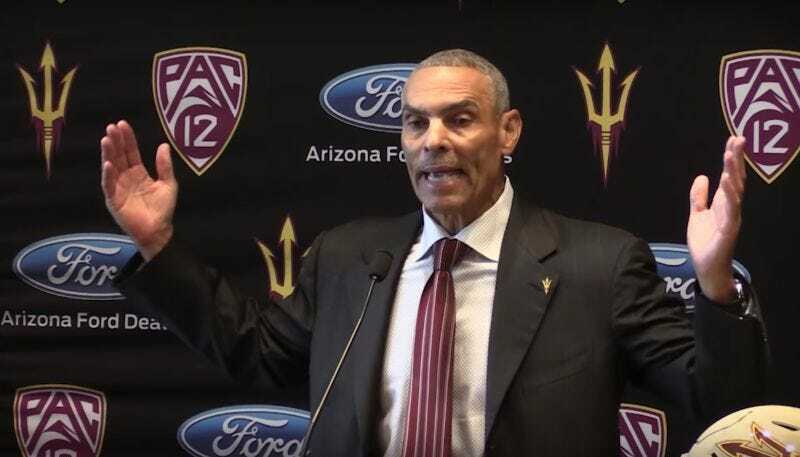 For two, Herm does make it clear that he won’t be yanking scholarships—as in, forcing players to leave school—but he’s talking more about the threat of taking scholarship players off the football team. “How many guys actually play in the game? Do 85 guys play? If you do the math, 45 players generally play in a football game. That’s the ones and the twos and some special teams guys. That’s the truth. I’m not making it up,” Edwards said. If true, that’s actually pretty fucked up. This is going to be a weird, weird year at ASU.